This book is a must have for the novice as well as the professional player! 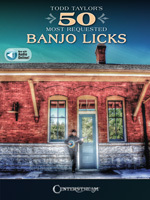 Each and every lick banjo players learn provides another vital piece to add to their repertoire and help develop their individual ability. Each lick is important, and Todd Taylor shares his licks and personal techniques he has spent a lifetime developing for the first time in this volume. These licks will make you a better player! Music examples are included in the online audio available for download or streaming.